Fresh clean oxygen is what our bodies desire. When we breathe bad air we create lots of respiratory problems and starve our body from the full oxygen it needs to ward off all kinds of ailments. What’s Alpine’s secret? As a professional carpet and upholstery cleaner servicing Huntsville Alabama for over 25 years, I’ve had to deal with countless odor problems inside homes, apartments, offices, autos and more. Most of the time it was not only in the carpet and upholstery but on the walls, ceilings and air ducts etc. Through the years I have found one brilliant air purifier system that Never let me or my customers down and this site is dedicated to it. This air cleaner has saved lots of time, money and my customer’s nostrils by not having to apply harsh chemicals to solve their indoor odor problems. 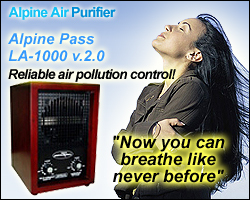 The “Living Air” purifier has helped thousands improve their life. You’ll have; More energy, better nights sleep, refreshing indoor mountain fresh air and less allergies. For odor, floating dust and musty smells you will notice results in as little as 15 minutes just like their sales letter says. Those are just a few of the many miracles that you will learn to love about operating one in your home. I invite you to learn more about this Amazing air cleaner technology Here. And sign up for a chance to Win an Alpine ‘Living Air’ Purifier. Alpine will also send you a monthly Newsletter with more info and news about our industry. While this will also greatly depend on which whole house air purifier model you purchase, air purifiers can consume anywhere from 18 to 175 watts of electricity or more. Unlike the Alpine, other models that actually are installed to your intake and home air system can be huge and can consume more watts. In comparison, a standard lamp bulb may use about 20 watts, while a computer uses between 100 and 300 watts of electricity. An air purifier isn’t likely to increase your energy bill by much, but if you are concerned, just ask how many watts the model will consume before you decide on a purchase. Alpine’s air cleaner makes whole house air purifiers simple. It’s powerful, small and sits on a bookshelf. Why spend thousands on installing a huge device to your air conditioning system. Save money and huge maintenance costs by trusting Alpine. We may not be able to claim our air purifiers as a medical device but here is one testimonial that touched my heart after this couple purchased an Alpine air cleaner. My husband has severe allergies, I smoke, and we have dogs in our home. My husband was getting three serum shots per week for his allergies, but even so, symptoms remained, so I told him about the Fresh Air purifier when I heard about it. He is extremely skeptical about products that sound “too good to be true”, but said he’ll give it a try for 30 days. I bought it and as each day went by, he was more and more impressed. He was feeling much better and our home smelled so clean that visitors wanted to know how we had done that. We bought the unit 2 months ago, and it’s one of the smartest purchases we ever made. We love it! Walking into our home to that wonderful clean smell is great, but best of all, my husband has quit taking allergy shots and feels so much better. He says he can’t live without his Living Lightning Air purifier. Don’t leave before you sign up for your chance at a free Alpine Purifier! Click Here! If you have ever had serious indoor air pollution problems drop me a comment. Let me know how you solved it. How many times did you have to try a new way? I’d love to hear from you …Leave your comment below. I like the site and it is def something we should all be looking into. thank you very much. Thank you for stopping by Brent! My dream of having a web site focused on clean and healthy air is finally a reality. Wow! Didn’t know there is such a thing as air purifier. The testimonial is really impressive. Didn’t know also that better fresh air can help with allergies but it makes some sense though. It’s really great that the husband is feeling better with the air purifier at his house. I guess cleaner air means you don’t breathe in dusts and other dirty stuffs that you don’t see in the air. Do you know of other benefits of the air purifier aside from helping people to get better from their allergies? Sweet!… It’s amazing to learn that it will only take 15 minutes to see the difference a purifier would make. I do tend to have sleeping problems and catch a few colds from time to time, so this is something I’m definitely going to try in my home. Thanks for your Alpine Purifier recommendation. Many of the illness that this world is facing today is because of the impure air that they are taking in. When we look at the many factors, vehicle fumes and the list is endless,enviormental polution I s causing many to become sick and many gave actually die.But thanks to modern tehenologhy that devices are being made to purify the air that we breath. Thanks again for sharing this wonderful information. How nice it would be if it became standard for every house, sold or built to have an air.purifier. No one really knows the mold, mildew and dust situation.before they move in. Yes a good, clean smelling home is very important to everyone I would think You know you need relaxed breathing not the short rapid breath taking, I do agree it can help your over all health wellness.. What kind of mainetnance if any is needed on the Alpine, and what is the square footage will it cover. Laslyt what is the price? Thanks for stopping by Ron. It’s easy for me and my Alpine customers to say that it seems much easier to breathe with the air cleaner running inside our homes. But one should experience it for themselves. Since the Alpine purifier technology reaches out to change the air verses others needing expensive filters there is little maintenance. One back dust filter needs washed with mild soap and water, a glass ozone plate that needs monthly or bi-monthly cleaning with water and ammonia and a light dusting inside the machine. Since the company has many different size models to choose from depending on one’s need, ranging from automobile purifiers, single room purifiers, home purifiers to industrial purifiers it’s easy to visit our site and take the air test. That will determine what type and model is right for you.